Yesterday afternoon I had the fun of seeing HHS CTO Todd Park give a guest lecture at the University of Michigan School of Information. (Apparently, it is part of a tour he’s giving to major universities and communities around the nation.) While I’ve seen Todd before, this was the first time that I experienced him ‘up close and personal’. His charisma is spellbinding and his vision is spot-on—it’s just what the doctor ordered. It was a modest lecture room, almost full with 50 or so attendees. Not surprisingly, most were students. The ubiquitous double projected screens on the wall behind seemed more crowded than necessary and everything paled once Todd started to roll. I had planned just to absorb and maybe send a few tweets—after all I live and breathe this stuff every day. [The arrogance! The arrogance!] That didn’t last 30 seconds. I started scribbling notes on the back of a flier I’d picked up on the way in, filled that in the first minute and opened the binder I’d brought, thankfully. It’s all about data liquidity in HIT as the foundation to foster process change that improves health and lowers cost. Todd featured the VA/CMS “Blue Button” as one example of easy data liquidity that is already having a big impact on patient empowerment and care coordination. The HHS role is to create an environment where innovation can thrive, in considerable part by making the vast stores of data available to the public in machine readable form (sanitized, of course). I admit, at this point, the question on my mind was where would Todd go next, towards the provider side, the consumer side, or some combination? I should have seen it coming. 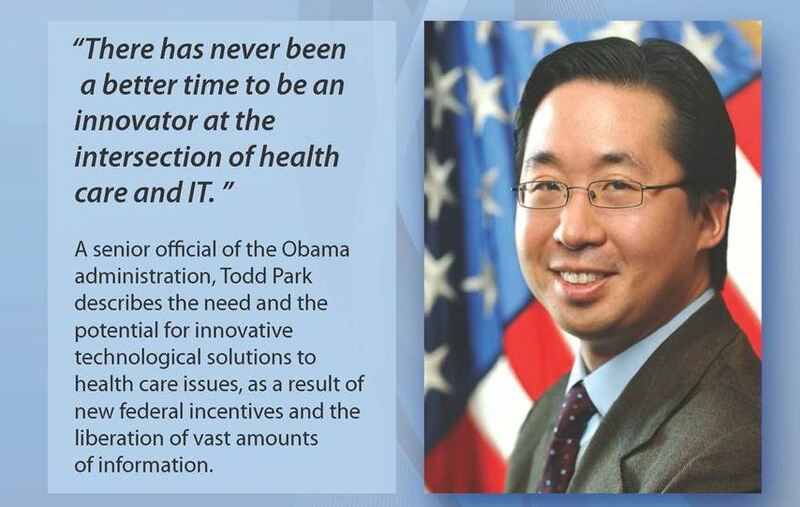 Todd’s primary focus was on the HHS’ role in creating an environment in which innovation can thrive. He talked about the vast stores of health data that are now made available to the public at no charge and gave a machine gun introduction to some of the companies that are leveraging the data and the opportunity in new and exciting ways. The remainder of Todd’s discussion focused primarily on consumers, where he believes the impact of the revolution will be greatest. He went on, talking about Hospital Compare, which allows consumers to compare providers in a given community, Asthmapolis, which uses a smart phone to plot on a map the locations and frequency of inhaler usage by people with COPD and asthma, and how it helps identify both at the individual and the population levels places where intervention may have a huge impact. And the machine gun kept firing with the possibilities and accomplishments. I, and everyone else in that room, truly believe. That was the only time I felt his comment was less than I’d hoped. He followed with something to the effect that patient-consumer demand will drive providers and vendors to offer electronic access to personal health information. And there we are. Back where we started—expecting consumer expectations and demand will change the way medicine is practiced. How long will it take for consumer demand to grow to the critical mass needed to achieve the point of inflection? Ultimately consumers will be the force, but right now we need a catalyst, an incentive, to allow that consumer expectation to take root and grow quickly. I agree with Todd that incentives + data liquidity = rocket fuel for innovation, but to the extent that providers are not required or incented to give easy electronic access to personal health information, and therefore patients are effectively denied true electronic access to their personal health information, that rocket ain’t goin’ very high—at least not as high as Todd’s vision would suggest. I’ll take Todd, my new BFF, up on his kind offer to correspond on this important topic by email, and will post any further developments. P.S. In yesterday’s post, I said I’d post something dealing with the economics of the proposed ACO rules. Well, this is more fun and a whole lot easier, so that will have to wait another day or two. Check back please.